Dave Splash Dot Com: The Event - "Your World To Take"
The Event - "Your World To Take"
Though there were some significant plot developments, overall I give a thumbs down to The Event's episode 109, Your World To Take. The episode focused almost entirely on the "aliens" and very little on Pres. Martinez and the government, or on Sean and Leila. The first big reveal in the episode is the sheer number of aliens living among the human population - the sleepers. When Sophia summons all of them to a meeting with a mass text message that read "1121944," we see that there are hundreds, maybe thousands of them. I was under the impression the number was in the dozens. 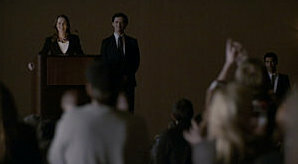 Sophia receives a standing ovation upon her return, and proceeds to re-assert her leadership now that she is back. Naturally, her son Thomas, who has been leading in her absence, has some issues with giving up power. In addition to being his mother, Sophia is much more sophisticated and strong than Thomas. She is unhappy with his leadership and tells him so to his face. Among the many issues confronting Sophia is the fact that many of the "sleepers" don't want to leave. They have lived among humans for more than 60 years, and many have families and friends here. Sophia will have none of it. She knows they only need a few more raw materials and they can reconstitute their ship and leave. She is not about to let some dissent among her ranks slow down her mission. This is the first real rift we have ever seen among the aliens. We also learn that they left their home planet initially because it had become barely live-able. Still, Sophia is unmoved. She didn't spend 60 years in prison so that they could stay here! One of Thomas's weaknesses, according to Sophia, is the ability of others to manipulate him. There is a possible hint of that in his dealings with a new sleeper (new to us anyway) named Isabel. She is among those who want to remain here, and she is clearly behind the plot to overthrow Sophia and have Thomas be the leader. She tells Thomas that his people will back him in this effort to take control. He then reveals his intent to kill Sophia the next day when the two travel together to retrieve a piece of their old ship. Isabel does not discourage him. We don't see too much of Pres. 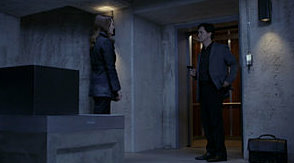 Martinez, Director Sterling, or the VP in this episode, despite the huge cliffhanger from last week regarding the VP. He is in the hospital recovering from the assassination attempt, and the president is there waiting for him to regain consciousness. Just as he does, his wife arrives and asks for a few moments alone. Mrs. Jarvis tells her husband that he needs to stay quiet or his family could be at risk. A few men stopped by her residence that morning (doesn't the VP's family get Secret Service protection?) and revealed that they know exactly where the Jarvis's kids live. It was a very direct threat from Dempsey, and the VP begins to reconsider his decision to confess. Either way, Dempsey wants him dead. 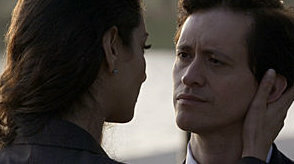 Sean and Leila have no idea where else to look for Leila's sister until they get a call from Agent Collier. She has looked into the list of names the two found, and reveals that one of the girls escaped and is back at home with her parents. It is their only lead, so they head there. When they arrive, they find the girl's terrified parents in no mood to answer questions. Their suitcases were already packed, and clearly they were planning on fleeing. Though their daughter acknowledges knowing Leila's sister, her parents still refuse to let Sean and Leila talk to her. They have not seen her new appearance either. Sean and Leila follow the family when they flee, and track them to a gas station. While gassing up, Leila follows the little girl and her mother to the bathroom, while Sean notices some suspicious activity. One of Dempsey's assassins is there, too. After getting as much information as the little girl can remember, Leila, Sean, the girl and her mother all flee the gas station once Dempsey's guy starts shooting. What followed was an excruciatingly long chase sequence with everyone running around in a corn field. Sean is able to disable the hit man, and once he does, he learns that the little girl was not his target, as everyone had assumed. Leila was. She was the one who Dempsey said "got away." Thomas's plot to kill his mother does not go at all like he planned. Perhaps sensing something was up, Sophia begins to play some subtle mind games with Thomas while on their plane ride. She reminds him of how fearful he was as a child, and tells him that he is too soft to lead. When they arrive at their destination, Thomas uses the opportunity to unleash his plot. He pulls a gun on Sophia and threatens to kill her. Sophia humiliatingly taunts Thomas and shouts at him telling him to go ahead and do it. Ultimately, Thomas cannot kill his mother. In addition to not going through with the plot, Thomas reveals what his mother has suspected all along: that he was being manipulated by someone. In this case, Isabel. When Sophia surprises Isabel at the spot she and Thomas were supposed to meet, she knows the jig is up. A frightened Isabel begs for forgiveness. Sophia gives her two choices: 1) being ostracized from the rest of her people forever or 2) shooting herself in the leg and maiming herself. She chooses the self-mutilation, and we can all (including Thomas) hear her wails and cries after the shot. The wound is not life threatening, but it no doubt hurts like hell. So, except for seeing that there is dissension among the ranks of the sleepers, and Sophia's claim that they could have left the Inostranka facility whenever they wanted to, we didn't learn a whole lot of "new" in this episode. We did learn that Sophia is whole lot more ruthless than she looks, however. I think that ruthlessness will be on further display in the future. The next episode is billed as the "Fall Finale," so The Event may be m.i.a. for a bit. Often times, networks use a show's hiatus as a time to re-tool a show that is struggling in the ratings. The Event is struggling. I just hope what emerges next year is not too different from what we have now. I like what we have now. Miles aka "The Old Man"
Hey everyone, I'm Dave. This my blog about music, television, movies, politics, pets, and whatever else I feel like. © Dave Splash International. Awesome Inc. theme. Powered by Blogger.